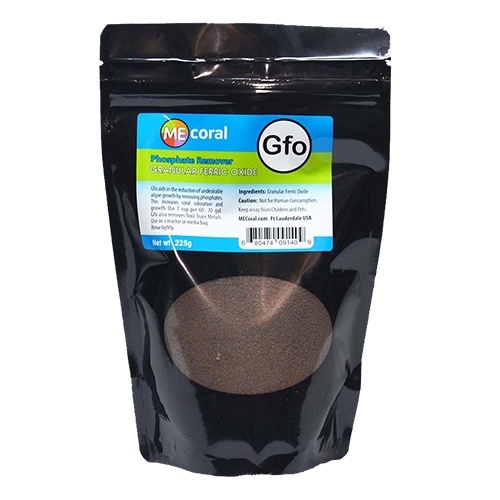 Granular Ferric Oxide (Gfo) is the only chemical utilized by most reefers to reduce Phosphates (PO4). Elevated PO4 levels bring undesirable algae of all types and colors. These high levels are also detrimental to coral growth and color. This is the area that is typically the biggest struggle for many aquarist. Natural Seawater has PO4 levels below .01. We suggest a target rate of .02-.05 with some arguing lower levels are better. Please test with a reliable test kit. 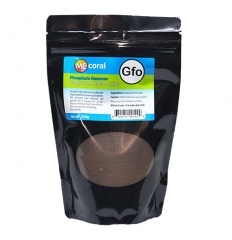 Gfo is typically used in a media reactor, but a media bag in the sump will work, just not as effective as water does not contact every side of the granules. Remember to change the media as needed. Use 1 cup per 60-70 gal of aquarium water. Net wt 250g.